Take a moment and think about it: You are spending a lot of time and money preparing, strategizing and executing some sort of social media plan for your company. Your hope was that social media would generate awareness, increase audience reach and ultimately, convince more people to click the “apply” button. But are you getting the results you expected? Chances are that the answer is no. So now you’re probably thinking that social isn’t all it was cracked up to be. And who can blame you? Five years ago, social was a cheap channel to build engagement, and all you thought about was Facebook and LinkedIn (and maybe a little bit of Twitter). Now, the costs are going up, Facebook has pretty much become a pay-to-play channel, Twitter is getting noisy and your analytics are showing that social media isn’t generating the impact you had hoped for. But what if there was a way to quickly and dramatically increase your social reach without maxing out your content budget? It isn’t just you – everyone is having this issue. But what if there was a way to quickly and dramatically increase your social reach without maxing out your content budget? It’s not a trick! Using data from our clients, we’ve found a simple way to double traffic to your best posts with almost no extra work. But before we can show you how, we need you to understand the difference between stock and flow. Let’s start by examining your social media content. Maybe pull up your Facebook or Twitter accounts. Look at the last 20 or so posts – you’ve got announcements for job postings, pictures from your last office holiday to-do, a link to a news article about you, a link to a blog post about an intern’s journey through your company, a video about a day in the life of a data analyst, a reminder that your company is sponsoring something, etc. It’s a lot of stuff! But instead of thinking of it as “a bunch of stuff,” try looking at it as either stock or flow content. 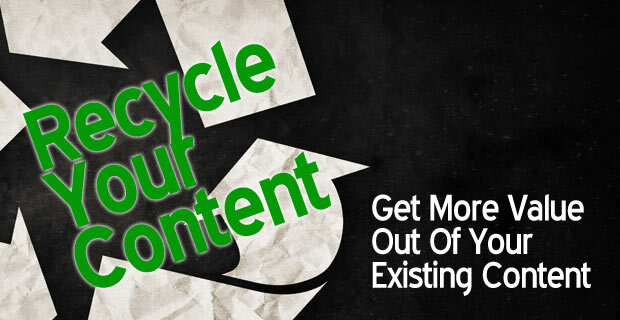 Stock content is content that is almost evergreen – content that has value for more than a day or a week. It might be that video about data analysts or the intern’s journey. Regardless of whether the content took you weeks to put together or just an hour, it is stock content. Stock content is very different from flow content. Flow content is the stuff that you post between stock content. It’s the ephemera of office life, like a picture of your Valentine’s Day office pancake breakfast or a link to a news article. Flow content is touchpoint content that doesn’t have a lot of substance to it. Some might consider it filler or fluff, but it serves an important purpose: It keeps the connection with your followers warm until you launch more stock content. It helps you maintain the content flow without having to build complex content. If you can see all your social media content through this lens, then suddenly you understand that some content has a half-life that can be measured in hours (flow content) and some that can be measured in months or years (stock content). That’s when you can take advantage of our content strategy. It’s actually very simple: We discovered that you can repost stock content three times and still get valuable traffic from it. So after you post that great data analyst video, don’t just stick it on a shelf and forget about it. Schedule three more posts over the next three weeks at differing times and days in order to double and triple your traffic to it. We’ve done it, and we know it works. (Sorry, but we can’t show you our data here.) We also know that if you do it properly, it won’t adversely affect your following. So long as you have plenty of flow content in between reposts, you won’t lose followers! Reposting helps you maintain a balance between stock and flow content so that you don’t tip too far to the “fluff” side. Additionally, it gives your content team a little slack time in order to focus on building great stock content on a slightly slower schedule. Don’t bother trying to repost your fluff content; that’s a recipe for follower revolt. You want to keep your followers feeling like you are a source of valuable content –not just fluff. So give it a try. Seeing your content as either stock or flow gives you an opportunity to put your best work in front of a larger audience. As a direct result, you will increase social engagement and sharing, drawing prime candidates to your career site. Great post James! I can attest that it works. I am posting popular yet older blog posts via the LinkedIn publisher and it’s more popular than the first time around.